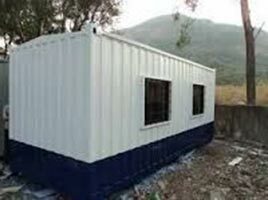 We are an experienced manufacturer and supplier of Portable Container Cabin from Karnataka, India. Backed by a team of strict professionals and a well-established manufacturing unit, we supply the best quality Portable Container Cabin. Irrespective of the location of your site we can actively design and supply these cabins thereby customizing it according to your requirements. The prices are the best you can get in the market for such a quality product.